Regiment/Catrawd: 438th Field Coy R.E. Died of wounds, 7th October 1917, age 33. William Parry was the son of William and Elizabeth Parry of Gronant Terrace, Prestatyn. He was born on March 15th 1884, and was baptized on August 7th that year. In the 1891 census for Wales, available on Ancestry, the Parry family were living in the Towyn district of Meliden. The head of the family, William Parry was 36, and a general labourer, who had been born at Mostyn. His wife Elizabeth was 30, and had been born in Prestatyn, as had all the children. They were Edward, 10, William who was 5, and daughter Jane, age 7 months. All the family spoke Welsh. In 1901 they were still in Towyn, at Brynhyfryd Terrace. William Parry Sr was 44, and a brickworker. Elizabeth was 42, Edward was 20, William was 17, and these two were described as brickworkers like their father. Jane was 10, and since the last census John age 7, and Sarah Elizabeth age 3 had been born. The two youngest spoke only Welsh, while the rest of the family spoke both Welsh and English. In the last quarter of 1905, Ancestry Marriage Records give the marriage of William Parry to Rosamund Stead. By 1911, they had set up home at 7, Gronant Terrace, Prestatyn. William was now 27, and described as a builder’s plasterer. He spoke both languages. Rosamund, also 27, spoke only English, as also did the children, who were Charles age 4, John Edwin age 2, and Elsie age 7 months. Rosamund had given birth to 3 children who were all living. William’s service records have not survived, but the website Soldiers who Died in the Great War confirms the details written above, and we are informed that he enlisted at Prestatyn. There is a card for William in the Roll of Honour Archives at Hawarden which states that he was 33 years old at the time of his death. It gives his parent’s names in addition to that of his wife, Mrs Rosamund Parry. His period of service was one year and four months, and also recorded is the fact that he is commemorated on the Meliden War Memorial. The card was signed by Mrs R. Parry. There are details concerning William, and also a picture of him on the website “Prestatyn Scala History Queue Mural.” The mural celebrates some of the history of Prestatyn and the Scala Cinema, and can be seen in the foyer. The Mural Project was started in 2009 at a time when the cinema was in the process of being rebuilt, and commemorates 100 years of the building which had opened in 1910. Its first manager was James Roberts, known as Saronie. The commission was given to Paul Young, a young artist and illustrator. The passage of time is shown by the changes in fashion, and in the building itself, up to the present day, as the people in the queue portray the various changes of each year. William Parry is one of three soldiers who represent the many from the area who lost their lives in the Great War. 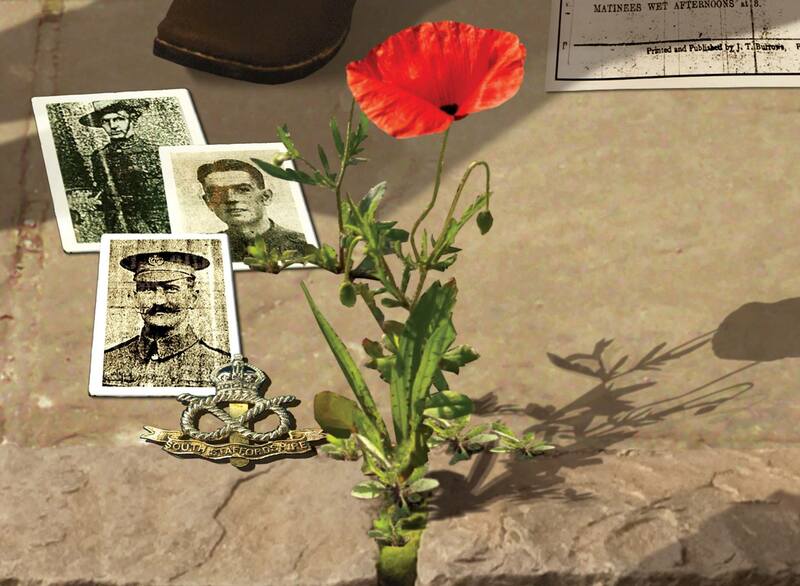 A poppy is shown growing from the pavement, with the picture of William and the other two Prestatyn servicemen representing the war years. William is the soldier at the bottom. William Parry, the son of Mr William and Mrs Elizabeth Parry of Lavender Cottage, and husband of Rosamund Parry of 7 Gronant Terrace, Prestatyn. He died of wounds at the 3rd Canadian Casualty Clearing Station, Poperinghe, Belgium. Mrs Parry, 7 Gronant Terrace, has received the following from Rev. R. Dowie, chaplain to the Canadians in France. The article, after expressing regret, also states that Sapper Parry’s brother John is a prisoner of war in Germany. In Memoriam. At Bethel on Sunday last, a memorial service was held for Private William Ellis, and Private William Parry, who had made the supreme sacrifice for their country. Both had been connected with the Church from boyhood. The Reverend Glyn Roberts conducted the service, and the Dead March from Saul was played.